Heat loss from a house or building occurs in almost every directions. 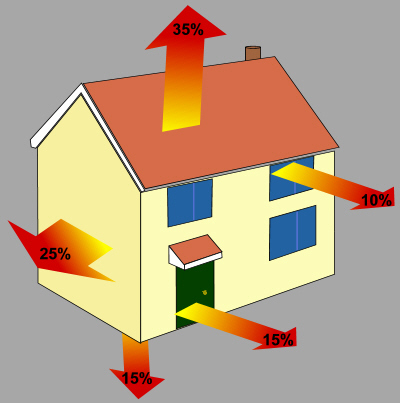 The picture below shows the typical heat losses from a house through the various parts. 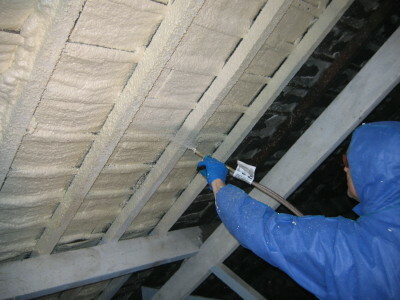 Loft insulation & cavity wall insulation are simple and efficient ways to prevent heat loss through a roofs and walls. Energy savings could amount to as much as 40% depending on the type of insulation and the thickness. 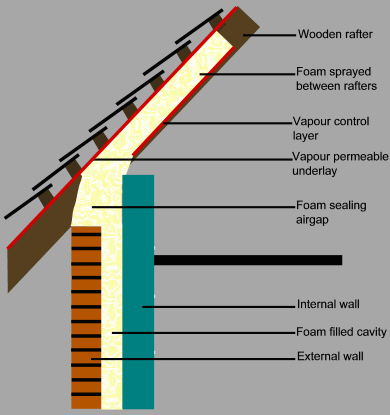 Insulation in loft spaces either at ceiling level or at rafter level will greatly improve the level of comfort in a house and significantly reduce heating costs. 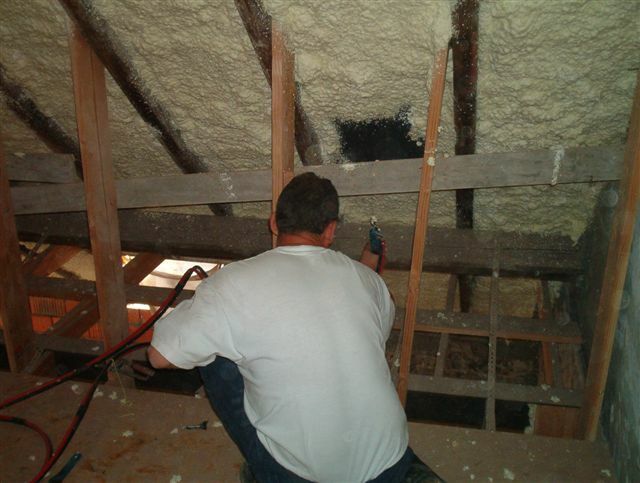 Where the insulation is installed between the rafters, this can create a living space in the loft or a "room in a roof"
We all know that heat rises and thus tends to accumulate in the upper floors or lofts. 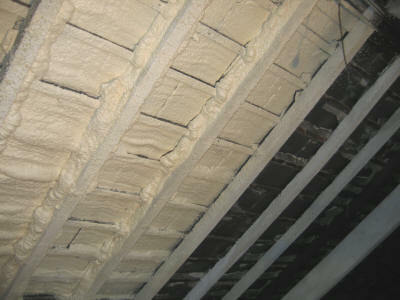 Ordinary plaster board ceilings are poor insulators, and heat is lost through the ceiling and roof. Many insulation materials are available - these range from materials like rock wool to expanded foams like polystyrene and polyurethane foam. Rock wool is a ceramic fibre, which is woven into a thick mat. It is available in rolls for insulating horizontal ceilings and batts & boards, for insulating walls and pitched roofs. It's main disadvantage is that it needs to be very thick to insulate adequately (often up to 12 inches thick to prevent condensation). It also has to be "fixed" in place and does not respond well to moisture (from roof leaks). 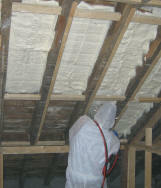 Polystyrene and polyurethane foams are amongst the best insulation materials known to man. They insulate so well that they can be relatively thin. Polystyrene and other board insulation is time consuming to install as it must also be cut and fixed into place. Spray foam insulation is ideal for roofs suffering from nail fatigue and tile slippage. "Nail fatigue" is the corrosion of the nails, which hold slates in place. Over time these nails corrode and the result is that there is nothing to hold the tile in place. 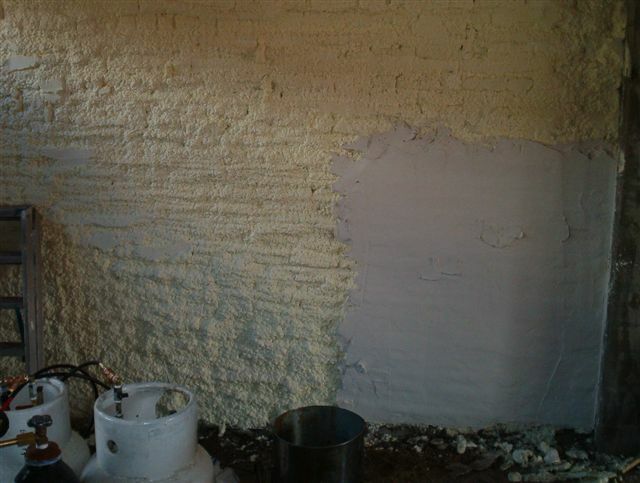 Spray foam is widely used to stabilise tiles and slates in a cost effective manner and thus avoid a costly re-roofing. The foam is sprayed onto the underside of the tiles and battens where it bonds strongly, creating a water-proof and very stable structure, that will prevent the ingress of wind driven rain and snow. 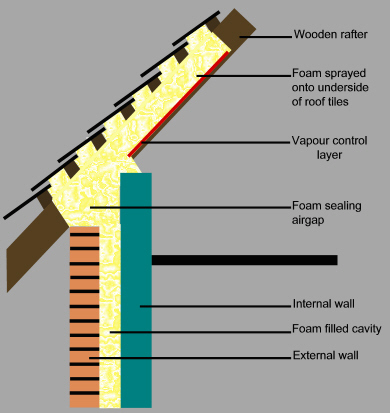 Spray foam insulation can be applied between the roof rafters to insulate the roof in newly converted lofts, or to insulate roofs in new builds. A 50mm air gap does not need to be left between the insulation and the tiles. 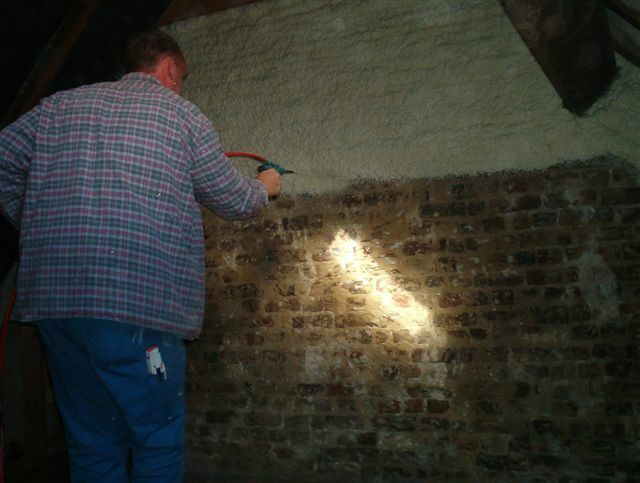 How easy is DIY Spray Insulation? Spray applied foam insulation is made simple with Handi Foam DIY spray foam kits. Follow the links on the left at the top of the page to visit our product & prices page and to find out more information about the foam kits. Why pay more than you have to when you can do it yourself?